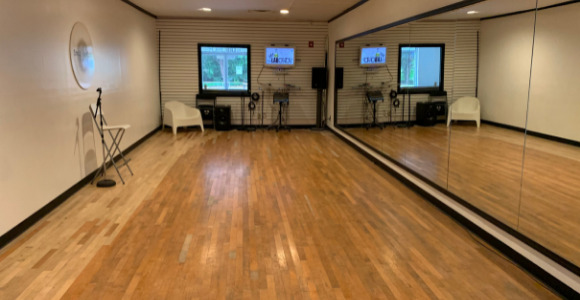 S.A.S Atl Dance/Rehearsal Studio has 740 square feet of finished maple dance/rehearsal floors space for only $35 per hour. It comes with a 16 channel mixer, 8 mic pre's & wireless microphones. Wall to wall floor to ceiling mirrors with a 5 speaker PA system including a 10 inch sub woofer built into the wall. Our dance studio is also equipped with a desk top intel mac with Wireless Internet and a 32 & 42 LCD screen's with wireless mouse/ keyboard. We also provide free of charge Hd cameras and Mic set up for streaming or recording your sessions. S.A.S Atl Dance/Rehearsal also has a exercise gym, large spa bathroom with stone rain shower and 4 person sauna included in the $35 per hour rental fee. SPECIAL DISCOUNTS FOR S.A.S ATL PLATINUM SUITE AND WRITING ROOM CLIENTS.